It’s all about the green….and this saint that seems to have spoken out against slavery, valued women, and influenced Ireland with Christianity. All good things, wouldn’t you say? So why not splash a few shamrocks around the house. And listen to some toe-tappin’ music. When it comes to seasonal home decor, I’m all about simple and using what you have on hand. And…because I love all things book page, I decided to use book pages and hand-cut shamrocks in decorating the mantel for St. Patrick’s Day. I began decorating the mantel by hanging a large medallion I created over the mirror. It’s fairly simple to do. The most challenging part for me was keeping the glue off my fingers. If you can make accordion folds, you can make a medallion. I created a detailed pleated medallion tutorial here. It will give you a pretty good idea of how to create a large book page medallion. The chief difference between it and a ribbon medallion is that you will be attaching book pages together to make that long accordion. Keep in mind that the technique is the same except you will be creating your ‘ribbon’ by gluing your accordion folded pages together, rather than just gluing and joining the ribbon accordion ends one time. It’s the most time-consuming part of the project, but goes fairly quickly. I had a little fun covering a couple of books with some green patterned scrapbook paper. One was just the spine end because the book was creamy and the spine was red. The other, just a simple temporary green cover for looks. To complete the look, the book cover was covered with green scrapbook paper. It was just enough green to set off the book pages. Then I free cut some shamrocks and used a small dab of glue to secure them to the pages on either side of the column. The rest of the items in the vignette were things gathered from the house in similar shades of green. What gives life to the mantel is this ceramic crock filled with fresh tulips. One of my dear friends, who lives many hours away from me, read on Facebook that I couldn’t wait to see tulips pushing through the ground. So, she decided to surprise me and had these gorgeous tulips sent to my house. Aren’t they beautiful? Such a breath of fresh spring air when there’s still more than a foot of snow still on the ground. Yes, I could have done more. I could have created some banners like I did for the Valentine’s Day mantel or my spring vintage window. But instead I chose simple and sweet in decorating the mantel for St. Patrick’s Day. What do you think? Does it say St. Patrick’s Day without going over the top? What’s your favorite way to decorate for St. Patrick’s Day? PleaseTell us about the camels. What kind of stone? Where did you obtain them? The camels came from the middle east and are made of jade. Hope your day has been beautiful and your husband is healing and pain free. Love the simplicity and clean look.The tulips really take it to the next level. Thanks Betty! I agree…it looked pretty flat until they dropped in. I’m going to miss them when they are spent. I have read a children’s book on this saint and his life was not easy and he even went back to Ireland to finish his missionary work there, after being set free from captivity! I do like the book medallion a lot. I’ve never been to great at this but I think people use a tool and it helps crease it better. I may try sometime!! I should have saved all those expensive college texts I threw out!!! There’s something about fresh tulips. I love them too. I had luck one year but not another. I think out here they have to be chilled first. Gwen…there are lots of scoring tools that can be helpful. Even using a bone folder to run across the crease makes it crisper. But, book pages are easier to crease than cardstock so it goes pretty fast regardless. I did learn that my imperfections were not noticeable in the finished product. Always struggling with perfectionism and working toward “It doesn’t have to be perfect to be beautiful.” I can’t tell you how many things in my life have been thrown away because they weren’t perfect….especially old things. I’m so grateful for grace to see the beauty now. Yes…the tulips do need to be chilled first. The fridge works. I LOVE YOUR BLOG! and these ideas! I just gave you a FB like! Thanks so much for sharing on the Thursday Blog Hop…I look forward to reading more! Pam…I am humbled by your warm comments. Thank you!! I did see you this morning over on Facebook. I’m delighted that you would stop and join in the fun! You should be seeing me on G+ as I’m following you there now. 😉 I didn’t see you on FB…unless I missed something. I love anything with text in the design, so I love your book and page decor. Always looking for new ways to incorporate books/writing into things. Thanks for these ideas. Isn’t it fun to play with books and pages, Gail? Thanks for popping by with your kind words of encouragement. This is literally (pun intended) adorable! Love the pleated wreath and vintage green touches too. Thanks for sharing at Fridays Unfolded! Awww…thanks Alison!! I appreciate the pun! Okay….that’s just…..cute! Simple and definitely not gaudy. Much nicer than what you can pick up that poor colour scheme store…LOL. LOVE the tulips. Ohmygosh, what a precious friend to deliver that loving breath of spring. Awwww….thanks! You know Mel….the timing of those blossoms was just perfect too. I am truly blessed with a dear friend. Your mantel looks great- love the paper wreath and the way you displayed the book. I like the touches of green you added and the tulips look wonderful- such a nice pop of color! Liz….that’s just the nicest thing to say. Thank you!!!! I can only imagine how beautiful your tablescape would be Arnoldo!! Enjoy your wonderful meal! That is so pretty! I love it! Often the store bought St. Patrick’s Day decorations are cheesy and cheap. What you did is so beautiful! Maria, you are so kind. 🙂 Thank you so much!! So clever! Looks so good! Thank you so much Sujatha!! You are so sweet Cindy. Thank you for your warm words! Love all your greens and the mantel looks amazing. Thanks for sharing at TTF! Your mantle looks awesome! Especially the book page medallion…it’s stunning! I’ve made medallions before, but never this large. I’ll have to try it! Thanks for taking the time to pop by! Hope your week has been extraordinary!! I love your medallion and book column. Your tulips are the perfect touch. I admit I’m partial to anything green, but your mantel is truly gorgeous! Great mantel. Love the tulips! Diane, your book page creations are my favorite things you create! Always so fresh and original! I’d love to see them all compiled into one post – in case I’ve missed one or two. Also, as a reminder of all the great things you can do with book pages. Your mantel design is beautiful! My husband actually mentioned to me that I should have all the book page posts together some where. Hmmmmmm…. Hope your week has been extraordinary, my friend! 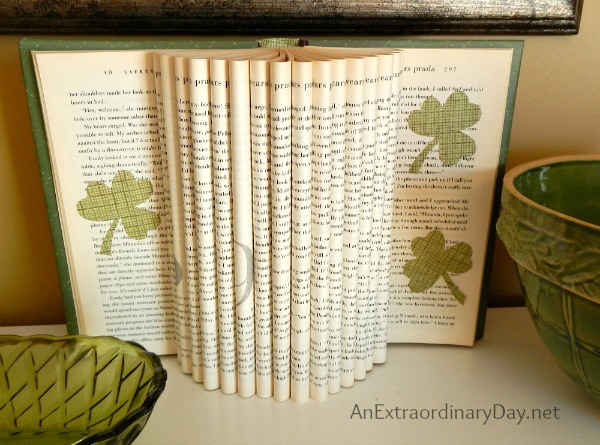 Lovely ideas for St. Pat’s decor – love anything book-ish! Thank you so much Donna! What is it about bookish thing that make our hearts go pitter patter? It’s beautiful! I did a VERY simple bunting but that was all. Your mantel turned out great! Thanx for sharing at THT. What an incredible idea, love this! And you could do it with all sorts of holidays. Thanks for sharing on the weekend re-Treat link party. Hope you link up to the party again tomorrow! What a gorgeous mantel Diane. I think it is wonderful and I love the book paper medallion.